This is another truly gem from the SWF broadcast vaults recorded in 1972. Minus Two founded in early 1971 in Mannheim (hometown of Nine Days Wonder) by organ player Günter Kühlwein (guest musician on Dzyan's 1. Album) and drummer Walter Helbig (also played with Nine Days Wonder and AERA) played a powerful progressive music sound sometimes with a certain sense of drama, melted classical influences with blues-rock and slightly jazzy hints. 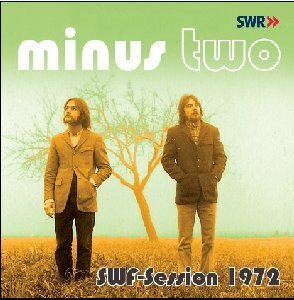 Early "Hardin & York playing" comes to mind, but Minus Two always showed their own imagination of progressive rock. All titles are self-penned and prove the musicians high level abilities playing their instruments and there are only organ and drums. Believe us, you don't miss any other instruments! This is a very complete sound by perfect trained musicians. CD contains 3 long tracks and short opener "Sticks & Keys" from the SWF vaults plus one bonus track. All titles were remastered from original master tapes. Booklet contains band history with a lot of photos. Don't miss this limited edition! Highly recommended.